From the Road2Race way of thinking, it’s a very easy “YES”…… I will be the first to put my hand up & honestly admit that chassis tuning is a tricky game. The more I journey into my study & career, I accept that I am never going to know it all…… though I am not giving up my quest to keep learning…. I have to be honest though, for me it has become a very powerful tuning tool & is something that I choose to incorporate into my work and truly place strong emphasis on this part of trying to achieve the best possible setup and handling outcome for both road & dedicated competition vehicles. 1/ What does your vehicle weigh….??? In the first instance,it’s very handy & useful information just to know your car weight….. Hear is a little secret: When it comes to handling & making vehicles fast “Weight is your biggest killer” and anything you can do to reduce it should be considered and only good will come from this. Basic law of inertia… Yes, your race car has built up plenty of inertia by the time you start your “turn in” at the beginning of turn one at Sydney Motor Sport Park….. It’s going to be far easier to get your car turn & begin to change direction if it’s lighter….. That’s only a fraction of it….. Reduced weight means quicker acceleration & top speeds…. Improved braking capacity…. Reduced energy robbing / tyre loadings resulting in a net increase in grip. The list goes on….. 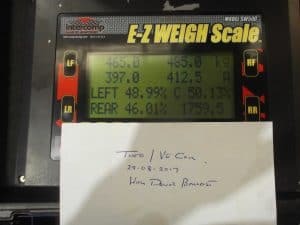 So the point is, as part of your race car development, just knowing vehicle weight on its own and being able to gauge and measure your weight reduction initiatives is all part of valuable vehicle modelling, learning & development. 2/ Static vehicle weight…… Very few cars would have a perfect static front & rear weight distribution….. That is the weight comparison between the front & rear of vehicles predominantly FWD vehicles miss the target by the most….. Then when it comes to side to side weight distribution, this is all blown away as soon as you add the driver (albeit, single seat race cars)….. So there is a lot going on with weight & when comes to static weight it is mostly ugly…… So what does having this information do for us or how can we use this to our advantage….. Well, honestly there isn’t much we can do….. However, it doesn’t end right there….. Once knowing where our static weight is we can improve the situation by moving moving heavier objects and parts of the car to more desirable locations within the vehicle…. Of course, one of the easiest improvements can be made simply by the relocation of a battery or perhaps careful placements or location of fuel cells etc to try & offset unhelpful static weight distribution…. Certainly worth considering during your vehicle build & development. 3/ Cross weight Percentage / Corner Weight Balancing: This is the real big one & part of the whole corner weighting exercise that will yield the greatest improvement in vehicle handling balance. It can be pretty easy to become confused with all this….. Essentially what we are looking at is the balance between the right front / left rear & left front / right rear….. As the name implies, we are looking at the cross weight / diagonals of how the weight is resting on each wheel….. To me, this is the most critical and valuable information I work with during a car set up…… I fail to know how you could hold your hand on your heart & say the job is done without knowing & working with this information. Our target is always 50% cross weight balance…. That is when you add the 2 x diagonals and divide them by the vehicle weight they equal 50%….. As per mostly American terminology…. A number over 50% (combined weight of the RF/LR is greater) means the car has wedge…. A number under 50 % (combined weight LF/RR is greater) means the car has reverse wedge….. In any case…. We just keep working until we can see 50% or least as close as we can…… Between 49.50 & 50.50 is pretty good…..
4/ How do you get there: The process for me at Road2Race goes something like this…… Honestly, firstly you need to take a deep breath, have patience and stay focused because as hard as I try I know its an operation that is time consuming and during the process there will be a lot going on in my head, knowing though it will be very worth the effort….. So lets say if I am finishing off a coil over install where basically your setup could be very well starting from your best educated guess on spring / ride height adjustments…… Before we get any where near the scales I will add ballast to the car (focusing on driver weight / average fuel loads etc) then work very hard on setting rides heights whilst at the same time being very mind full that my wheel alignment is pretty close (just to ensure there is no unwanted bind up when trying to settle down the suspension…. Ride heights will be set as per application while ensuring we have the chassis rake we require. It is only at this point I then roll the car onto the scales……. It is at this point we measure our cross weights. 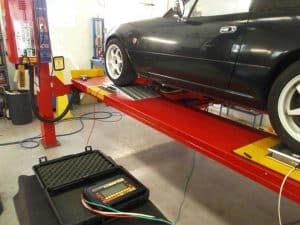 If the chassis is square and all components are undamaged etc then you may find you have hit the target with your cross weight percentage and its then into the wheel alignment…. If not it then becomes an exercise of working with both ride height & corner weight measurements until your zero in on your target…… The weight measured on each wheel is dependant on the spring adjustment on that corner…. To add weight you raise a corner (spring)…… To reduce weight you lower that corner (spring). As mentioned, this is really where you need to work at it, balancing your desired ride height with cross weight…… It should be noted at this time that static weight and cross weight are two very different values and should not be confused. Static weight distribution cannot be changed by raising or lowering a spring. 5/ Highlighting problems: Its is during the cross weighting operation that deficiencies, problems & faults is your chassis platform may surface…….. Sometimes….. The desired result and balance cannot be achieved. This can be from a variety of reasons that may include a bent or twisted chassis, damaged or bent suspension components…. 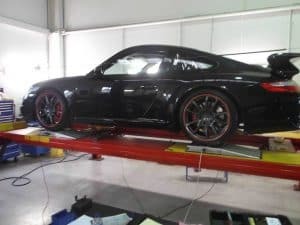 The reality is that through your corner weighting operation, at least you now know and gives you a greater understanding of of your chassis platform and vehicle set up….. Also, it now gives you a chance to investigate and make possible corrections to the problem. All this valuable information was obtained from a corner weighting exercise…. 6/ Case study: I would like to share a workshop experience that demonstrated the power of a quick check of corner weight…. A few years ago I had a dedicated race car that was presented to me that was suffering from chronic handling problems. Of primary concern to the owner was the fact that this vehicle could not make a 1 hour endurance race without completely destroying the right hand front tyre… only on left turning biased circuits like Phillip Island and Sydney Motorsport Park….. By the time we got the car it had been everywhere….. A majority of high end suspension repairer’s and specialists, dealerships had all been at it etc…. Many attempts and changes had been made to the car and it was only getting worse. At the time it wasn’t believed that I or anyone could fix the car…. Though some how it just stumbled into my workshop. After hearing out the problem and before I had even laid a hand in the car, I had a bit of a suspicion what was going on….. So with a roll onto the scales, the problem was found in minutes. The “Cross Weight Balance was 60%”. With all this extra weight mostly on the right hand front wheel…. For God Sake, it was no wonder the poor old R/H/F wheel was failing….. With such a massive amount of static weight on this wheel then combined with the cornering loads applied from left turns, this tyre never stood a chance of survival….. It was clear that the people trying to sort this car had just dug them self into a deep hole that kept getting deeper with every miscalculated modification. The reality is that there was nothing that could not be fixed with this car…. In the end a spring change, corner weight & alignment was all that was needed…. All this through the power of corner weighting…..
7/ Conclusion…. I felt compelled to share my views on this topic for some time now…. This has mainly come about due to the information being given out in the suspension industry that corner weighting is a waste of time. I am concerned by this…. For me it has resulted in cancelled bookings though of much more importance I find it very misleading and perhaps a potentially dangerous statement, as critical aspects of a set up and the possibility of highlighting problems go unnoticed and missed. Off on a tangent for a bit, ride heights of street / race cars is much more than personal preference…. As a specialist, I have the duty to inform my clients of the pro & cons of inappropriate ride heights & chassis settings…. What constantly comes up is cars that are over lowered…. This results is little or no suspension travel before something hits and the show is over for a suspension that keeps crashing out. Also, in all cases suspension arms / drive shafts are at angles that will adversely affect handling and may result in premature wear or component failure….